Four times the pixels as 4K. Credit: PC Watch. Click for original. We're only now starting to see hardware come out that can handle 4K resolution gaming (such as Pascal), but that hasn't stopped Sharp from trotting out a prototype 8K resolution (7680x4320) monitor at CEATEC, a Japanese technology show. That translates into four times as many pixels as a 4K panel. Credit goes to PC Watch for spying the new panel and snapping a bunch of photos, including the one shown above. 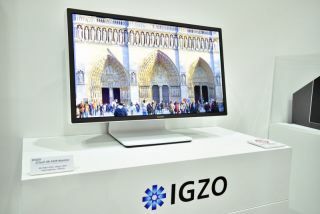 It's a 27-inch monitor, and what's impressive about the display beyond the 8K resolution is that it's an IGZO-powered In-Plane Switching (IPS) panel with a 120Hz refresh rate and High Dynamic Range (HDR) support. Sharp has been infatuated with IGZO technology. IGZO is a semiconductor material used in a panel's backplane. It consists of indium, gallium, zinc, and oxygen, hence its name, and can be used with various types of displays (TN, IPS, OLED). One of the advantage of IGZO over silicon semiconductors is that electron mobility is 20 to 50 times higher. This means that IGZO displays can use smaller transistors, which in turn leads to lower power consumption and higher pixel densities. At 27 inches, the prototype panel Sharp is showing off has a pixel density of 326 ppi. It also boasts a rated 1,000 nit brightness. Combined with HDR and more than 33 million pixels, Sharp's display should be capable of producing some incredible looking visuals. Sharp isn't saying anything about price or availability just yet, but assuming this 8K monitor makes the transition from prototype to a mass produced item, expect the price tag to be pretty steep. It will also be targeted at business users and graphics professionals, so don't fret, your 4K display isn't obsolete just yet. Besides, you'd need a monster setup to game at 8K anyway. On top that, a display like this one uses multiple inputs to handle the high bandwidth requirements. Nevertheless, it's good to see the monitor market continue to march forward instead of standing still, as it had done for several years before 4K made a mainstream push.